When searching for a skilled LASIK Doctor in Vancouver, Washington; or Portland & Central Oregon, Dr. Crews is one of the Pacific Northwest’s Best. 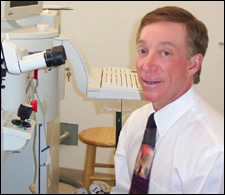 For over 20 years, Dr. Stanley L. Crews has been providing vision correction surgeries to residents of Vancouver, Washington; and Portland & Central Oregon. He is a Board Certified Ophthalmologist and is an active and participating member of the American Society of Cataract and Refractive Surgery. Stanley L. Crews is a native Floridian and a Phi Beta Kappa graduate of the University of Florida. He obtained his M.D. degree from the University of Miami and completed his Ophthalmology training at the University of Washington. After completing his residency, he became skilled in many advanced vision correction techniques including LASIK. Dr. Crews’ record of superb results assures you of receiving the highest quality of personalized medical care from a highly trained and experienced LASIK doctor. If you are seeking a LASIK doctor, CREWS LASIK & CATARACT CENTER provides the highest level of service and the best level of technology from one of the most experienced LASIK doctors in the Pacific Northwest. LASIK eye surgery is an extremely important decision to make and can have a profound effect in your life. In Crews LASIK & Cataract Center’s web site you can discover more about one of the area’s most distinguished LASIK doctors and also gain valuable insights into the various technologies and services that are being offered.